Video shows a swollen Sacramento River spilling over the Fremont weir into the 57,000-acre floodway. Notice that the floodwaters spread through individual irrigation ditches and drains, the blue hues darkening as levels rise. Hydraulic models need such fine detail when the acreage at stake is relatively small – say a 1,500-acre rice farm in the bypass. The higher the resolution, the better the model can predict the effects of flood flows. Early next year, the U.S. Army Corps of Engineers plans to release free and open-source software that greatly reduces the cost of running floodplain models at high resolution. The Yolo Bypass presents one of the most promising opportunities to restore floodplain habitat for native fish in the Central Valley. The 57,000-acre floodway protects Sacramento and the southern Sacramento Valley from floods in wet winters and is farmed each summer. The bypass also provides important wetlands for water birds and opportunities for bird watchers and hunters. Can the bypass be managed to better support native fish while still providing flood control, agriculture and bird habitat? Recent innovations in hydraulic modeling will help researchers at the UC Davis Center for Watershed Sciences – and anyone else – explore the possibilities with greater speed and accuracy. The Hydrologic Engineering Center (HEC) of the U.S. Army Corps of Engineers developed the improved software and plans to release a beta version early next year, free of charge. Known as HEC-RAS-2D, the two-dimensional floodplain flow model will be the first of its kind in the public domain. Having this tool freely available greatly reduces the high costs of model development and use for public agencies and interest groups. It also will improve planning and policy discussions, which are often muddled when competing models give different answers. Users will find the new model more cost-effective to run than current proprietary versions, providing more accurate and transparent insights for less cost. We test-drove an early version of the software for our ongoing studies of the Yolo Bypass. Our investigation looks at whether landowners can raise young salmon on seasonally flooded fields while continuing to profitably farm and provide water bird habitat. The bypass already can be a highly productive and good food resource for fish when flooded (Sommer et al. 2001, Schemel et al. 2004), but the timing, duration, and frequency of flooding could be improved (Williams et al. 2009). We’re developing an optimization model to explore when, where and how floodwaters might most economically be applied to manage all the diverse activities. The HEC flood simulation model will help us determine whether solutions from this separate optimization analysis are realistic. Would there be enough water at the right times to flood enough, but not too much of the bypass? Do the fields targeted for inundation have the channels and berms to deliver and hold water for the desired duration? If an optimal solution calls for engineered modifications to the floodplain, we can use the HEC model to test the effects of those potential changes. The HEC model has two key technical advantages: accuracy and speed. Most flood-flow models require the cells within a grid to become either “wet” or “dry” based on “threshold” values of water depth. Those values, however, are derived from professional experience rather than rigorous mathematics. The new HEC model dispenses with these fuzzy thresholds and folds the wet/dry determinations into the model’s governing equations, using algorithms developed by Vincenzo Casulli of the University of Trento in Italy. The HEC used another Casulli innovation that further improves modeling accuracy at no greater cost in time or money. Typical grid models define elevation only at the corners of a grid cell and interpolate linearly between them. Smaller cell elements smaller improve accuracy, but require much more computation time and expense. The new model incorporates into each element a subgrid of topography as detailed as the underlying digital elevation model (DEM). The result is more accurate representation of the bathymetry, regardless of the element size. Applying the HEC software to Yolo Bypass was relatively easy and worked well. But preparing the DEM for the simulation took some work. The elevation data comes from remote sensing technology (LIDAR) that reads the tops of surfaces, without characterizing what they are. It cannot distinguish a railroad bridge from a levee, though two have very different effects on flows across the bypass. We digitally removed bridges and causeways, chopped off treetops and dewatered ditches and drains for a truer picture the floodway’s topography. We’ll further refine and apply the bypass simulation model and make it freely available. Our modified DEM together with the HEC modeling software will better inform discussions on the future of the bypass. Agencies, farming interests, conservation groups and other stakeholders will be able to glean insights from the same simulation model at relatively little cost. William Fleenor is a senior researcher who specializes in hydrodynamics and hydraulic modeling at the UC Davis Center for Watershed Sciences. Robyn Suddeth, a doctoral student at the Center, is developing a multi-objective analysis of the Yolo Bypass as part of her Ph.D. research. Lee, Aaron, 2013. A preview of RAS2D, two-dimensional modeling in HEC-RAS, RASModel.com, 30 April 2013. MacWilliams, M.L., F. G. Salcedo and E. S, Gross, 2008. San Francisco Bay-Delta UnTRIM Model Calibration Report, prepared for the California Department of Water Resources, 309 pgs. Schemel, L.E., Sommer, T.R., Muller-Solger, A.B. & Harrell, W.C., 2004. Hydrologic variability, water chemistry and phytoplankton biomass in a large floodplain of the Sacramento River, CA, USA. Hydrobiologia, 513 (1-3), 129-139. Sommer, T., Harrell, B., Nobriga, M., Brown, R., Moyle, P., Kimmerer, W. & Schemel, L., 2001. California’s Yolo Bypass: Evidence that flood control can be compatible with fisheries, wetlands, wildlife and agriculture. Fisheries, 26 (8), 6-16. 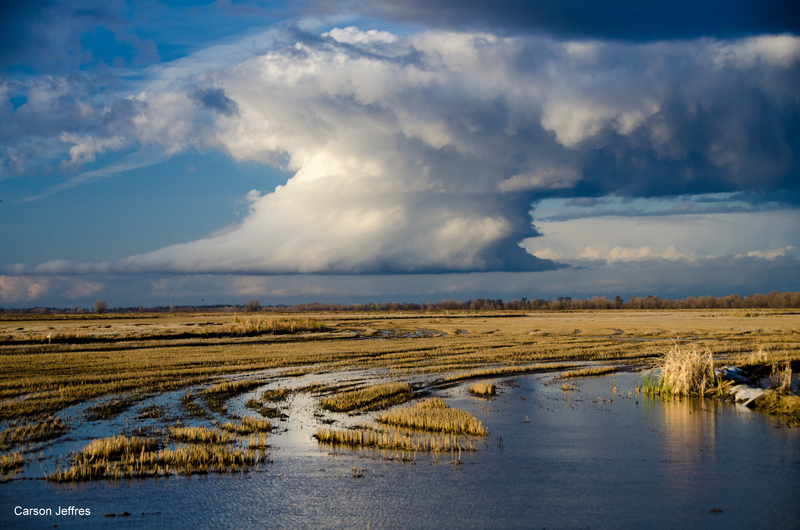 This entry was posted in Uncategorized and tagged floodplain, Robyn Suddeth, William Fleenor, Yolo Bypass. Bookmark the permalink.